Coming off the back of a tenacious 17/18 season which included a slew of amazing open-air events, the launch of The Warehouse Collective plus the triumphant second edition of Days Like This Festival, we\'re hitting the ground running and kicking off the 18/19 season with an epic triple header at the beloved Greenwood Hotel. Three artists whose careers have taken quite different trajectories, but all every bit as impressive as one another. 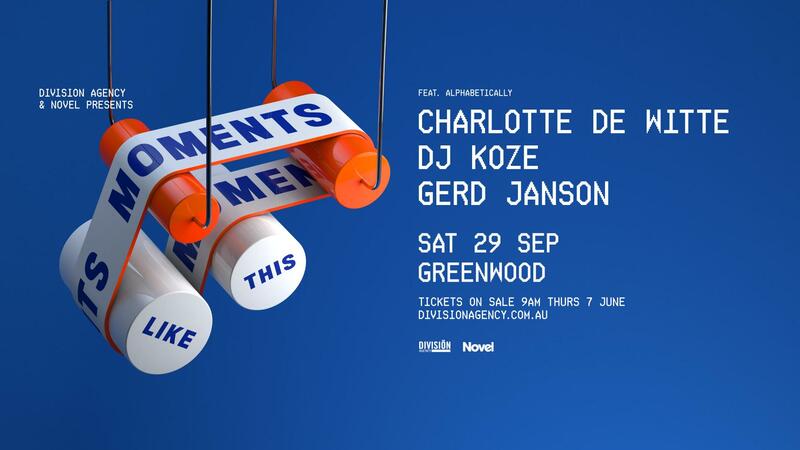 Whether it\'s through listening to Koze\'s catalogue of countless world class records, witnessing pure mastery during one of Gerd Janson\'s residency sets at Panorama Bar (or anywhere for that matter) or seeing Charlotte De Witte send rooms and festivals around the world into a frenzy with her uncompromising and headstrong techno, they are three acts who have captured their respective audiences relentlessly. We\'re ecstatic to kick off what is shaping up to be our biggest season to date with something we know will be nothing short of an electronic music spectacle. Not many can stand taller in Germany\'s electronic dance music scene than DJ Koze. He can rightly be described as one of Germany\'s longest running servants of dance music, a foundation member if you like. The readers of Germany\'s trend-setting SPEX Magazine correctly voted DJ Koze the DJ Of The Years for 1999 - 2004, and now the listeners of global dance music correctly calls DJ Koze one of the world\'s best. His remix of Lapsley\'s u2018Operator\' went nuclear, and with the recent release of his recent album Knock Knock, Koze is set to go number one on pretty much every planet just outside of earth. This will be his first Australian return in over 4 years. In the short time she\'s been releasing music, Charlotte de Witte has become one of the most exciting acts in techno (if not all electronic music) today. As we\'ve seen on releases through Turbo, Suara, novamute and more, which include standout tracks like \'Closer\' and \'Control\', de Witte favours an intense, minimalist style of techno that emphasises dark moods, vocal lines and heavy drums. A style that has in turn, earned her numerous main-stage slots at festivals and events worldwide. Gerd Janson Gerd Janson is one of the most highly respected DJs in the world of house and techno. Quite often, u201chighly respectedu201d goes hand-in-hand with u201cunderratedu201d but over the past few years, audiences around the world have also found out what insider types already knew: Janson is a DJ that reconfigures the classics you already knew in an unexpected way u2013 and introduce you to new classics, a few months (or years) before you\'ll hear them played everywhere else.